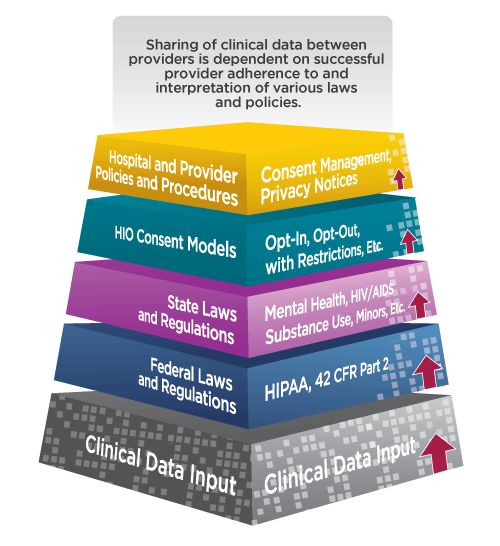 Moreover, many states have privacy laws pertaining to health information that are more protective than HIPAA, restricting disclosure of specific categories of information deemed to be sensitive, such as mental health and communicable disease information, without explicit consent from the patient. Further, hospital systems and provider groups are responsible for setting their own privacy policies, which vary and in some cases are more restrictive than federal or state laws based on narrow legal interpretation. Hospital systems and provider groups may apply a more restrictive interpretation of the law to avoid legal risks associated with improperly sharing patient information. The variable nature of hospital and other provider policies creates a further layer of complexity on top of federal and state laws and can be an additional barrier to sharing patient information.